Photos and pictures of the Merry Cemetery in the village of Sapanta, Maramures North West Romania. One of the most extraordinary cemeteries in the world is the Merry Cemetery In Maramures. Each grave has a tall wooden tomb marker with across onto which are painted with folk art decorations and a scene from the deceased life along with a poetic anecdote. 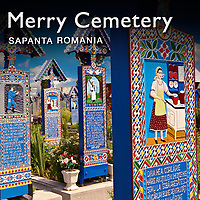 The merry Cemetery is a joyous cemetery and celebrates the lives of the deceased inhabitants of Sapanta. A wonder amongst the graves introduces visitors to the ex inhabitants and shows what they did and in some cases the accidents that caused their deaths. Three more days she would have lived I would lie, and she would read (this cross). You, who here are passing by Not to wake her up please try Cause' if she comes back home She'll criticise me more. But I will surely behave So she'll not return from grave. Stay here, my dear mother in-law! The local artist that started this unusual tradition of tombstone painting was rumoured to have bee Stan Ioan Patras (1908—1977) who carved his first epitaph in the 1930’s starting a trend that led to the 700 or more oak crosses that stand in the Merry Cemetery today. Patras was born into a family of wood sculptures who carved the traditional architectural decorations on the traditional Maramures houses. Patras started carving at the age of 14 an began to carve small poems onto tombstones and by 1936 he has perfected the style of the tombstones of the Merry Cemetery. The background colour of the tombstones is blue which is known as Sapanta Blue by the experts. Other colure used followed local folk law traditions : Green - life, Yellow - fertility, Red - passion, Black - death. After his death in 1977 his apprentice, Dumitru Pop, carried on the tradition moving into Patras’s house and turning his workshop into a museum. After the dull grey cemeteries of Northern Europe the Merry cemetery offers a more celebratory outlook on death allowing visitors a glimpse on how the inhabitants of Sapanta lived and died.